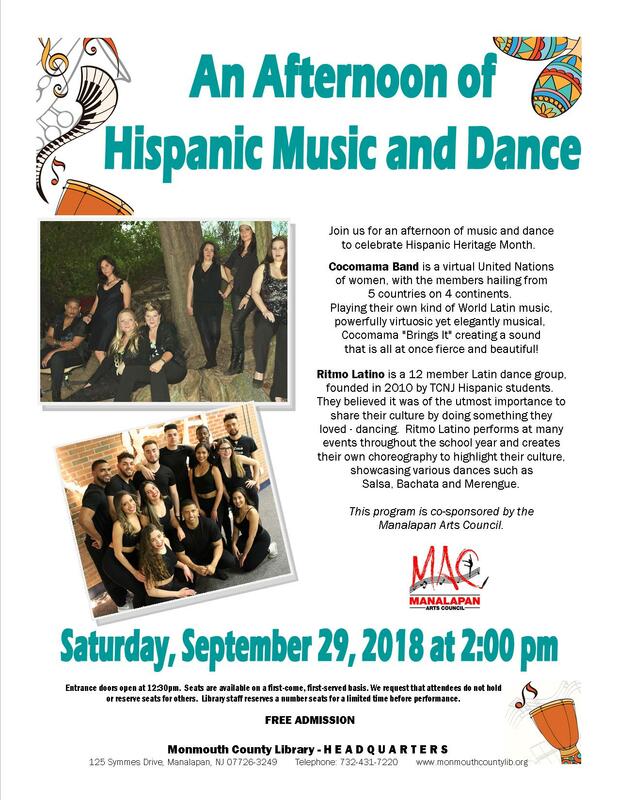 Join us for an afternoon of music and dance to celebrate Hispanic Heritage Month. This will take place on Saturday, September 29, 2018 at 2:00 PM at the Monmouth County Library Headquarters. Cocomama Band is a virtual United Nations of women, with the members hailing from 5 countries on 4 continents. Playing their own kind of World Latin music, powerfully virtuuosic yet elegantly musical, Cocomama "Bridge It" creating a sound that is all at once fierce and beautiful! Ritmo Latino is a 12 member Latin dance group, founded in 2010 by TCNJ Hispanic students. They believed it was of the utmost importance to share their culture by doing something they loved - dancing. Ritmo Latino performs at many events throughout the school year and creates their own choregraphy to highlight their culture, showcasing various dances such as Salsa, Bachata and Merengue. This program is co-sponsored by the Manalapan Arts Council. Entrance doors open at 12:30 pm. Seats are available on a first-come, first-served basis. We request that attendees do not hold or reserve seats for others. Library staff reserves a number seats for a limited time before performance.